From women publishers, women patrons, and women printers we turn to women authors, and limit ourselves to one place, one time, and one genre of literature. 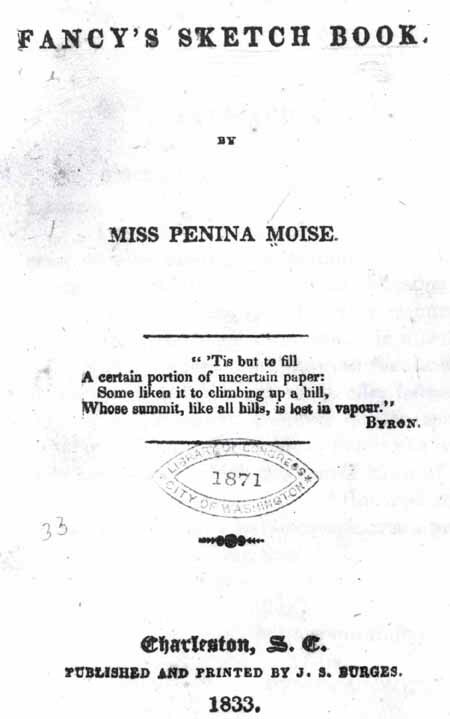 In nineteenth-century America we may seek in vain for one Jewish male we might call a poet, but we do meet four women who gained distinction as poets: Penina Moise (1797-1880) [See also the biography of Moise], Rebekah Hyneman (1812-1875), Minna Kleeberg (1841-1878), and Emma Lazarus (1849-1887) [See also the biography of Lazarus]. Born in 1797 in Charleston, S.C., then the largest Jewish community in America, Penina Moise lived there the rest of her life. After her father died when she was twelve, she had no further formal education; nevertheless, she persisted in study and reading and soon turned to writing. Self-taught, she became a widely published writer, her poems and sketches appearing in the Washington Union, New York's The Home Journal, Boston's Daily Times, the New Orleans Commercial Times, Isaac Leeser's The Occident, Godey's Lady's Book, and her hometown newspapers. Members of her large family intermarried and strayed from the faith, but for Penina her religion was the center of her life. For some time she was superintendent of Beth Elohim's Sunday School in Charleston, and after the Civil War, she joined her sister and niece in running a private school. By that time she had gone blind, but she continued her literary activity by dictating poems and essays to her niece. Oh, not as strangers shall your welcome be, Come to the homes and bosoms of the free. Penina Moise, Fancy's Sketch Book, Charleston, South Carolina, 1833. Rare Book and Special Collections Division. A Western Sun will gild your future days. Of Thy worshipper, O Lord! Cleave fore'er the vital cord. Save me still Thy praise to sing. May be spent in tears and anguish. See I not a better land? Hold I not a Father's hand? Born in Philadelphia to a Jewish father and Christian mother, Rebekah Gumpert, raised in her father's faith, remained a devout Jew all her life. Following a business failure, her father had to take the family to Bucks County, where there were no facilities for formal education. Like Penina Moise, Rebekah acquired her literary background by individual study, mastering French and German, and later in life, Hebrew. She married Benjamin Hyneman, took his name and reaffirmed his faith as her faith; but when she was five years wed, mother of a son and expecting another child, her married life came to an end. Benjamin never returned from a business trip to the West. It was believed that he was murdered for the valuable jewelry he carried to sell. Rebekah never remarried and took to writing stories, a novelette entitled Woman's Strength, but most of all poems, many published in The Occident. In 18 5 3 a collection of them, The Leper and Other Poems, was published in Philadelphia. Thy children tread to win their goal? Nor sorrow's blighting wing o'ercast. And nations knelt before her throne. Still keep us Thine, forever Thine! The first book of poems on Jewish themes was Rebekah Hyneman's The Leper and Other Poems, issued by the Jewish publisher and communal leader of Philadelphia, Abraham Hart. in her preface, the author proclaims "the very sincere love I bear for the faith of my adoption" (she having been born of a Jewish father but a Christian mother). That love is found on almost every page, especially in her series of twelve poems on "Female Scriptural Characters." The first two are on Sarah and Rebecca, of which our illustration offers a sampling. Rebekah Hyneman, The Leper and Other Poems, Philadelphia, 1853. General Collection. When Minna Kleeberg arrived in the United States from her native Germany in 1866, she brought with her a reputation as a well-regarded poet. A year earlier she had gained wide recognition for her poem, "Ein Lied vom Salz," a powerful plea for the removal of the Prussian tax on salt. Her poetry expressed devotion to her faith and a passion for social justice. Daughter of a physician, she received as fine an education as a girl could obtain in mid-nineteenth-century Germany. After her marriage to Rabbi L. Kleeberg, her poetry turned to liturgical creations, while continuing to serve as a vehicle for social expression. Her poetry appeared in a variety of German-language periodicals in Germany and in the United States. Most of her poems were lyrical, some topical-urging the emancipation of women, calling for the broadening of democracy-and some liturgical. A gathering of her poems, Gedichte, was published in 1877 in Louisville, where her husband was serving as rabbi. Minna Kleeberg was best known to the American Jewish community for her hymns which appeared in the most widely used Jewish hymnal in nineteenth-century America, Isaac M. Wise's Hymns, Psalms and Prayers, In English and German (Cincinnati, 1868). Ten German hymns by Minna Kleeberg form the largest number by any poet. They celebrate the Torah, man, faith, and the holidays. A poet on two continents was Minna Kleeberg, who gained some renown in her native Germany, and again in America where she relocated with her husband, Rabbi Louis Kleeberg. Her book of poems, Gedichte, was published in Louisville, 1877, where her husband was serving as rabbi. She was better known in her adopted country for her liturgical poems. Ten hymns in German, the largest number by any poet, appear in Isaac M. Wise's Hymns, Psalms and Prayers, Cincinnati, 1868. Minna Kleeberg, Gedichte, Louisville, 1877. General Collection. Almost from her childhood she complained of the subordinate position which tradition and custom assigned to woman. Upon her thirteenth birthday and the following Sabbath she shed bitter tears that she was not, like Jewish boys of her own age, entitled to take part in the public reading of the law, and by this rite be solemnly consecrated to the cause of Israel ... The vindictive accusations of Richard Wagner ... she met in a widely circulated paper, with a few bristling articles. Her poetical effusions, as well as her bold and vigorous defence of her co -religionists, were acknowledged by many letters of appreciation from all quarters, even from the other side of the ocean. The Crown Prince of Prussia, the Chancellor Bismarck, Edward Lasker ... The departed was a poet by the grace of God. Almost the entire second volume of The Poems of Emma Lazarus is devoted to Jewish poems. Among these are evocations of deeply felt Jewish sentiments, passionate cries for the renewal of the Jewish national spirit and translations from medieval Jewish poets Solomon Ibn Gabirol, Judah ha-Levi, and Moses Ibn Ezra. Certainly the most gifted and best known American Jewish literary figure of the nineteenth century, her essays on Jewish themes are no less important than her poetry. (Emma Lazarus) The Poems of Emma Lazarus, 2 volumes, New York (1889). Rare Book and Special Collections Division. And both embrace the world.